The single-rotary-drum Lyco screens at the Virginia Poultry are very robust, and are very well constructed. Virginia Poultry installed several liquid/solids separation screens for its turkey feather and offal processing. The two new primary and one secondary state-of-the-art rotary-drum screens, provided by Lyco Manufacturing, created optimized throughput and operational efficiency, while reducing water consumption. Located in Hinton, Virginia, in the heart of the Shenandoah Valley, Virginia Poultry Growers Cooperative (Virginia Poultry or VPGC) is America’s eighth-largest turkey processor, and the second largest in Virginia. 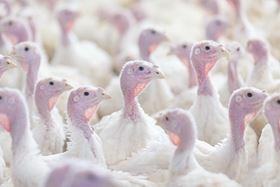 Supplied by 165 contract turkey growers spread throughout the Shenandoah Valley of Virginia and West Virginia, the cooperative processes 25,000 tom turkeys per day averaging 40 – 45 pounds each, five days per week producing more than 250 million pounds of turkey annually. The plant 100% debones the whole turkey, sending the parts out to other plants for further processing. Incorporated in 2004, VPGC has, since the beginning, been committed to producing an exceptional product. It was one of the original processors of antibiotic-free (AFB) and organic turkey products. Its programs have consistently been recognized by the trade as superior, and verified independently as exceeding government and industry standards. VPGC administers a proprietary organic program that carries the USDA Certified Organic Seal. Employing 560 people working within its 250,000 square-foot state-of-the-art processing plant, Virginia Poultry’s business continues to grow, while the cooperative commensurately invests into upgrading its facilities and equipment. Recently, these upgrades included installing new liquid/solids separation screens form Lyco Manufacturing (Lyco) for its feather and offal processing. “We put in a new primary screen for liquid/solids separation of our feathers,” said Phil Miller, engineering manager at Virginia Poultry. “After the birds are killed, bled out and scalded, they are feather picked. That feather-laden water stream, flowing at about 500 GPM, is run though our new liquid/solids separation screen that separates the feathers from the water. The feathers go to rendering, while the de-feathered water is circulated back to the feather picking area for reuse, and combined with make-up water. This is a very efficient system for the continual reuse of this high-GPM flow of water. Following evisceration, and inside/outside bird wash, the turkey goes into a chiller. The liquid/solids separation equipment selected was single-rotary-drum screens from Lyco Manufacturing. The screens utilize rotary action to separate turkey solids from the water. The water stream enters the drum from the inside and screens out solids to within 0.04” with the primary screens, and to 0.02” with the secondary screen. The screens are manufactured from wedge-wire stainless steel. The triangular shaped wedge-wire is far less apt to plug than sheets that are perforated. In poultry processing facilities, the efficient operation of rotary screens is diminished when poultry fats and other slick particulates clog the screen openings. Many screens let material pass through because they do not have the ability to manage the volume of particulate matter in the slurry. This is a common problem with traditional screening equipment, limiting the volume of wastewater and load that can be moved through a screen, which causes water and particulate to make their way through unfiltered. Each of the three Lyco screens utilizes a unique mechanical traveling spray clean-in-place (CIP) system. Using only two spray nozzles moving back and forth, the system effectively keeps the screen from clogging, but consumes only 10 GPM, approximately 10% of the water used with conventional spray bars. Because liquid/solids separation equipment is subjected to long periods of operation under stringent and harsh conditions, many system designs do not satisfactorily maintained consistent effluent flow, particulate capture and uptime. For a liquid/solids separation system to be effective in capturing high levels of primary and secondary offal while maintaining high-uptime operability, it must be heavy-duty, durable, and engineered to be user-friendly, tool-friendly, mechanic-friendly, and operate with minimal maintenance. Mechanically, the Lyco screens are designed with a number of unique features. For example, inside the wedge-wire drum full continuous flights have been welded into place. This permits the drum to handle surges more efficiently. All dry components are positioned outside of the frame, easily accessible for maintenance. Automatic jack screws are also provided. A very key aspect relating to the mechanical integrity of Virginia Poultry’s rotary drums is the centrifugal-casting of their drum support rings. It is common knowledge that rotating drum screens will eventually break apart. This is an inherent weakness in the way virtually all drum screens are designed and manufactured, which is to say, the stainless steel plate is rolled and welded. It is virtually impossible to get a drum screen of this size within close enough cylindrical tolerance, after having been rolled and welded, to keep it from eventually breaking apart. 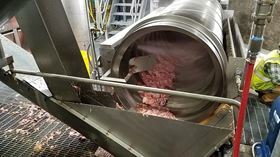 All drum screens that have been conventionally manufactured have a limited life, but that is not the case with the three Lyco single-drum, rotating screens in place at the Virginia Poultry plant. These drum screens are manufactured completely different, there is no rolled plate and there is no welding. These drum supporting rings have been centrifugally cast to within 15,000ths-of-an-inch roundness. Molten metal is poured into a cast that is spinning at high speed. Consequently, they maintain their roundness for the life of the drum, and they do not break.